A news cycle and music industry both forever changed by technology have conspired to burst the professional bubbles of a growing number of musicians given premature media-darling status. Look at the likes of Uffie and The Black Kids—performers who moved to the front of public consciousness and then just as quickly threatened to move immediately to the back after respectable periods of press praise and small releases eventually centered around a debut or new album. In this day and age it builds word-of-mouth, sure, but does it also kill momentum? 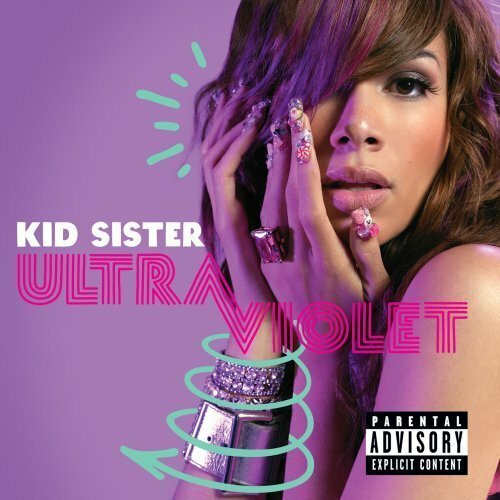 And why do some of these artists, including Chicago rapper-ette Kid Sister on her own debut Ultraviolet, complicate matters by smothering any whiff of promise? Melisa Young, younger sister (get it?) of a member of DJ duo Flosstradamus, started out by tagging along and MC’ing their gigs. From there, she parlayed and parlayed and parlayed her rep until she had on her side producers and performers up to and including fellow Chicagoan Kanye West. She managed to wrangle him, his longtime DJ A-Trak, Spank Rock producer XXXChange, and members of Swedish House Mafia for her first singles: the keenly entertaining hip-hop of “Pro Nails” and the earnest but ultimately middling blog-house boasts “Control” and “Right Hand Hi.” After four years on the map, Kid Sister piles onto a fully realized Ultraviolet nine more songs with double the starpower (Estelle and Cee-Lo Green contribute vocals, Sinden and Yuksek work behind the scenes) and a songwriter roster shamelessly in the double digits. She only really sounds like a centerpiece on “54231,” “Let Me Bang 2009,” and “Daydreaming,” her flow contrasted against tracks with a playful, almost airy house feel. If all of Ultraviolet resembled this, she might be onto something. It’s possible Kid Sister could strike while the iron of buzz is hot, or at worst cooling, and quickly refocus herself. Real talk, though: If it took this many people to write 37 minutes of techno-flavored rap tripe—34 if you discount the Queen Latifah cover “Step”—maybe Kid Sister and the whole crew should consider new lines of work.